When you trick people into laughing at themselves, that's wit. If you don't laugh at yourself, everything becomes heavy. James Maury "Jim" Henson (September 24, 1936 – May 16, 1990) was an American puppeteer, artist, cartoonist, inventor, screenwriter, actor, film director, and producer. Henson's Muppet and other puppet characters populated children's educational television program Sesame Street, sketch comedy show Saturday Night Live, The Muppet Show, The Muppet Movie and The Great Muppet Caper. He created advanced puppets for projects like Fraggle Rock, The Dark Crystal, and Labyrinth. 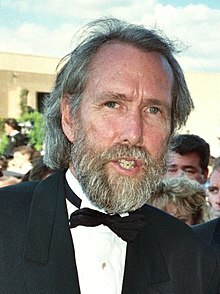 During the later years of his life, he also founded The Jim Henson Foundation and Jim Henson's Creature Shop. He won two Emmy Awards for his work on The Storyteller and The Jim Henson Hour. I suppose that he's an alter ego. But he's a little snarkier than I am - slightly wise. Kermit says things I hold myself back from saying. Blau, Eleanor (May 17, 1990). "Jim Henson, Puppeteer, Dies; The Muppets' Creator Was 53". The New York Times. Retrieved on October 24, 2015. It's Not Easy Being Green: And Other Things to Consider (Hyperion, 2005). Cf. Wisdom from It's Not Easy Being Green: And Other Things to Consider (White Plains, N. Y.: Peter Pauper Press, Inc., 2007), p. 49. Freeman, Don (December 18, 1976). "Chief Muppet is shy". Beaver County Times. Copley News Service: p. 5. There must be a lot of shy actor in puppeteering. His work is the puppeteer's statement. It's his outlet. If I had to face the audience myself, as Jim Henson, I'm sure I'd be just a bit shy. But when it's your puppets that face the audience, it's different. That I can do very easily. In response to Don Freeman's question: "Is the puppeteer a shy actor?" Personally, I prefer working in the background. Frankly, I'm a lot more comfortable if I'm wearing a puppet. I couldn't do ventriloquism. I don't have any interest in splitting myself in two, the way a ventriloquist does — half-himself, half the dummy on his knee. 1982 interview with Judy Harris, republished in 2005 book edited by Joel Eisenberg: — Harris, Judy (2005). "Legacy – Jim Henson". in Eisenberg, Joel. Aunt Bessie's How to Survive a Day Job While Pursuing the Creative Life. Topos Books. pp. 64–66. ISBN 978-0-9767575-0-4. I was very interested in theatre—mostly in stage design but I did a little bit of acting. I've never felt any sense of competition with anybody, and we're all friends. We're all good friends. I do remember doing shows strictly in black and white, too. If any-thing, there's a difference in working with color in England and the color in the U.S.
Jim Henson interviewed by AP about Fraggle Rock in 1984, cited in: — "'Fraggle Rock' Shown in 90 Countries - Henson's Puppets Known Worldwide". Toledo Blade. Associated Press: p. P-4. February 15, 1984. The whole idea with the show from the start was to go international. I really began to appreciate puppetry [while doing Sam and Friends]. There are so many forms of puppets. The ones on 'Sesame Street' are probably the most simple that we do. With 'The Muppet Show' we used to play with a lot of different styles. That's what it was: a variety thing. 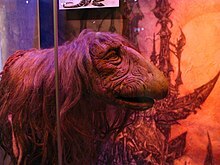 The puppets in 'Dark Crystal' were very complicated, and some quite unpleasant. In that movie, I think we got into areas a bit too realistic. With puppets, I don't think you should try to duplicate what humans do. It can cause problems. Puppetry's a lot harder than people realize, and it's particularly difficult doing a movie. You have this scene with all these puppets, and when something goes wrong, you've got to set the whole thing up to do it again. With people, you ask an actor to walk across the room a second or third time, and he does it. That's it. Puppets have the same sort of graceful aging that cartoon characters have. Mitgang, Lee (January 6, 1986). "The man inside the Muppets speaks". Chicago Sun-Times. Associated Press. In actuality, Muppets was a word we just coined. It was merely to be the name of our act. ... I used to say to people that it was a combination of 'marionettes' and 'puppets.' ... But then I stopped telling this lie, and I'm back to the truth: It just came out of midair. No, I don't believe we've ever designed a character around a person. Usually, we start out with a kind of personality. With Big Bird we knew we wanted to do a large, a great big character. He should represent a child so he can make the kinds of mistakes that kids make, and talk about it and be out front about that. I'm sure Kermit will stay young a lot longer than I will. Baker, Kathryn (July 29, 1987). "Muppet master tells the tale of 'Fraggles'". Chicago Sun-Times. Associated Press. There are people who think that we should never reveal anything, never show puppeteers and all of that. It tends to be something that parents worry about more than kids, because kids work just at face value. I know parents are often concerned: 'Oh, no, I wouldn't take my kids into the studio because it would destroy all their illusions.' It's a fairly adult concept. We started off with this fairly grand concept of, if you were to tackle it at a children's level, eliminating war. What would you do? A lot of the shows relate to interrelationships and attitudes, again, always trying to do it within the context of a very entertaining show. Christy, Marian (July 14, 1989). "King of The Muppets". The Boston Globe. I think it's good to be your own person. But individuality is a mixed blessing. People who are 'different' are isolated. I always felt that I was not a part of things in general. I've always been outside of things. Even as a kid, I felt isolated. Isolation makes you sensitive. As a kid, I felt I was the only person who was like that. But there's a good side to isolation. It makes you sensitive, and sensitivity is part of the creative process. There's great value in being able to step back and laugh at yourself, at life and at attitudes. Laughter helps you put everything into perspective. He thought it was fine to scare children. He didn’t think it was healthy for children to always feel safe. What do we want our children to get from Henson’s work? The same thing we learned from it. The philosophy of a gentle dreamer. While there's no doubt Henson was a master craftsman and puppeteer, his true artistry lied in the way he channeled his soul into his work. Jim Henson was a one-of-a-kind visionary whose works have entertained and sparked the imagination of millions of people across the globe for generations. Tanya Lopez, senior vice president of original movies for A+E Networks — cited in: Karen Butler (July 9, 2015). "'Jim Henson's Turkey Hollow' to air on Lifetime this November". United Press International. Retrieved on October 17, 2015. Frank Oz, as quoted in Q&A: Frank Oz on Henson, “Dark Crystal” and the Kwik Way, SFGate, (June 28, 2007). What do we want our children to get from Henson’s work? The same thing we learned from it. The philosophy of a gentle dreamer. The message that was encapsulated in “The Rainbow Connection” – the one about the “The lovers, the dreamers, and me.” It’s the idea that life is about making a difference, a positive change. And we’ve all heard it, even the Howard Roarks among us, calling our names. David Zahl (November 21, 2011). "The Gospel According to Jim Henson". Christianity Today. Retrieved on November 2, 2015. Henson was, by all accounts, a bit of a saint. Read any biography of the man, and you will walk away almost suspicious of his overwhelming decency and personal integration, his unfailing optimism and boundless energy. What made the biggest impression on those around him was apparently not his astounding creativity, but the passionate and compassionate way he lived his life. ... Henson reportedly distanced himself from his church as he grew older, downplaying sectarian concerns for the sake of reaching a wider audience with his somewhat amorphous message of hopes and dreams and rainbow connections. (The urban legend that Henson died because of Christian Science-based refusal to receive medical care is just that: an urban legend.) Vestiges of Mary Baker Eddy do surface occasionally in his work, in the form of a can-do sunniness about the human condition that would be a lot more cloying if it weren't dressed up in so much inspired silliness. Silliness, in fact, is where Henson shone. It kept the feel-/do-good-ism from ever succumbing to the piety of political correctness. His faith in humanity began from an acknowledgement of limitation, not an illusion about perfectibility. He knew that joy flowed from honesty, rather than around it—sound familiar? In a similar way, Christians, whose identity is found apart from our ever-changing and often hopeless abilities and attributes, are free to laugh at ourselves. This is part and parcel of Christian joy. Henson may have preached self-belief, but all his stories find people desperately in need of (and finding!) help from others. Despite the sometimes insufferable can't-we-all-just-get-along aspect of Sesame Street (and let's face it, Fraggle Rock) much of Henson's work dealt more seriously with human suffering, both self-inflicted and otherwise. The Dark Crystal (1982) is nothing if not a parable of Fall and Redemption, and Labyrinth (1986) has a distinctly Pilgrim's Progress-like, um, progression. Henson may have believed with all his heart in a "positive view of life," but his work reflects a larger truth. Indeed, Henson understood that to truly reach another person, you must aim beyond the intellect, at the heart—at the unguarded, joyful corner of the soul known as the inner child, which, incidentally, is where Jesus was especially focused. Puppetry and humor were Henson's tools for penetrating adult defenses. While the post-Henson outings have all had something to recommend them, his absence has been acutely felt, not the least in the character of Kermit, whom Henson voiced. One almost wishes the Muppet-verse had had the good sense to retire the green felt when Henson shuffled off the planet. Kermit's scenes are too often marred by the nagging (and distracting) feeling that we're dealing with an imposter—a toad in frog's clothing, if you will. Whitney Matheson (May 15, 2015). "Flashback: Remembering Jim Henson, 25 Years After His Death". ET Online. Retrieved on October 17, 2015. Henson gave his creations such vivid personalities, wit and expressions it was easy to believe each had a beating heart beneath the felt. Henson was an innovator from the start: At a time when many TV puppets relied on wood and strings, he opted for softer materials like felt and foam. This enabled his creations to express a range of emotions, unlike, say, an eternally grinning Howdy Doody. Bill Prady (May 15, 2015). "Jim Henson's Muppets legacy lives on 25 years after his death". Las Vegas Review-Journal. Retrieved on October 17, 2015. Jim was tall. He was gentle. He sounded like Kermit when he talked. He was enthusiastic and filled with ideas. He was also an astonishing performer. There's not much to the Kermit puppet—it's practically a sock. But when it was on Jim's hand, there was another creature in the room. Jim giggled when he laughed. His sense of humor could be sly and wicked. The people who worked for Jim felt like family and he treated them like family.